Holiday Home in Puerto Del Carmen, Lanzarote, Canary Islands - Puerto del Carmen Beach lies just 110 yrd from the complex. Sleeps 2/3. 1 bedroom apartment with communal pool / pool bar. Very popular holiday complex in a central location (Jable Bermudas). All amenities on your doorstep. Just 110yds walk to the beach with all water-sports. Ideal for families and couples. XL kingsize bed in the bedroom with bed settee in the living area (see photos for reference). There is a charge of 50 pounds per week for the 3rd guest. 100 pounds non refundable deposit secures the booking with remaining payment required 4 weeks before arrival. A minimum 5 day booking is required in the low season dates with 7 day minimum in high season. Mature couple with grown up children and grand children. Been visiting del Carmen for 12 years and stayed in loads of different complexes, we fell in love with the central location of this apartment. In my honest opinion you simply cannot fault whats on offer on it's door step. It's a well run complex with an excellent pool bar which all adds to make it an ideal spot to enjoy the year round climate that Lanzarote is famed for. Perfect location, 2x spar supermarkets on door stop. Friendly staff with huge well run pool bar. Fully tiled bathroom,walk in shower, wash basin, wc. 2 two seater bed settee for 3rd person, (all bed linen supplied). 40"LCD TV, DVD player with selection of DVD's. Fully fitted kitchen, large free standing fridge with large freezer compartment, microwave, toaster, sandwich toaster, kettle, all homely utensils and commodities are catered for. There are 2 championship golf courses on the island. Costa Teguise established in 1983 is a mature course and a challenge to any golfer. The course is approximately a 20 minute drive. Tias opened in 2008 and promises to take its place with the best courses in the Canaries - only a 5 minute drive. Utility Room: N/A Cleaning / Towels / Linen / Maid service: Towels and lining provided. Towels not to be used for pool or beach. Fantastic time cant wait to go back. 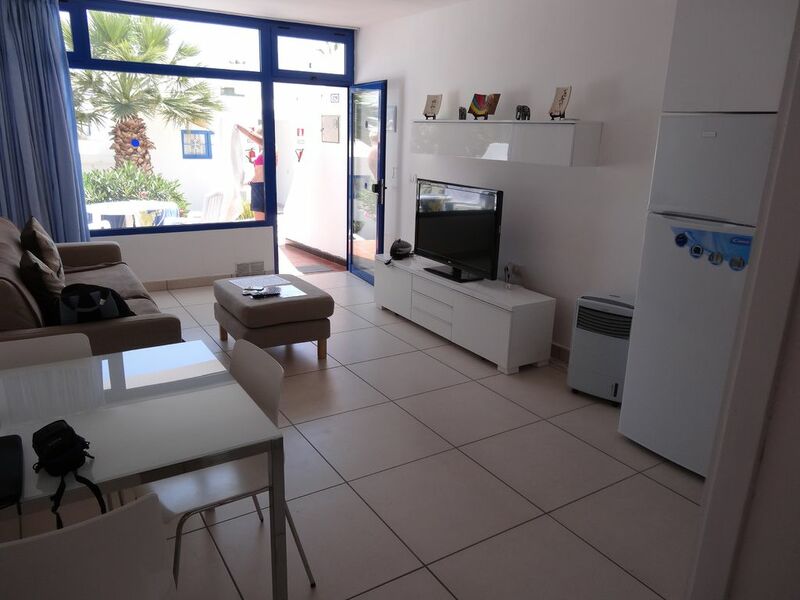 Definitely recommend this apartment.very modern and clean.great pool and pool bar.everyone very friendly and welcoming.great location to main strip only few minutes walk away to shops,bars,restaurants and beach.will definitely be returning to this little gem. Perfect location, perfect apartment loved it! The apartment and complex were modern and clean, central for beaches the bars and shops. Very friendly staff at the pool bar. Perfect for a relaxing week of winter sun. Thank you for taking the time to write a review and I hope you visit again :-). The popular Playa Grande beach is just a few minutes walk away. On this beach there are cafe's for refreshments, freshwater showers and toilets. Sunbeds and parasols are available for hire as well as pedlo's. The beach itself is well maintained and cleaned regularly. Arrecife is the main and only airport on the island, and is approximately 10-15 minutes from the apartment. Taxis are readily available outside the airport and will cost roughly 14-18 euros to the apartment. Car hire is available from the airport, or there are lots of car hire firms on the main strip in Puerto del Carmen.